Britain’s first solar-powered ice cream van has opened for business, and it’s not just its customers that are soaking up the sun. 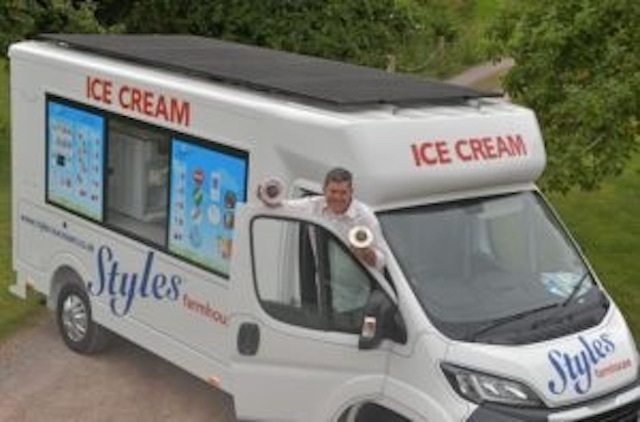 Exmoor-based Styles Ice Cream has created a prototype van that uses roof-mounted solar panels to charge a bank of batteries that keep the freezers, fridges and internal lighting running, the system only switching automatically to a back-up LPG generator as a last resort. “If the sun is shining all day then we can operate on 100 percent solar power and only if it turns cloudy do we need about half an hour’s help from the generator – but with the extra batteries we are installing we should be able to cut its use almost to zero,” said Styles founder David Baker. Former sheep farmer David, from Minehead, Somerset, is in the process of patenting the design and is planning a £1 million investment to replace his entire fleet of 11 vans with clean-energy versions. “The van itself is diesel-powered but once we arrive on site the engine isn’t turned on again until we leave and the sun does the rest. It’s saving me £15 a day in fuel plus the cost of plugging into an electricity socket on the showground – and that can be as much as another £150,” added David.